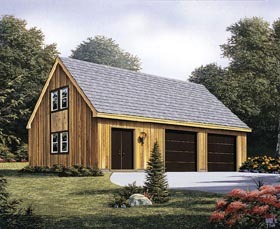 Question: What are the size of the garage doors and is a single door an option? Answer: The size of the two garage doors are 9’-0”x7’-0”. 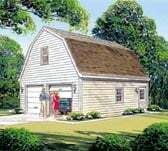 The plan does not show an option for a single garage door and there is a post located in the center of the garage between the two garage doors supporting the loft floor above. Question: What is the workshop width? What is the depth of the loft? What is the minimum height of the loft area? Is the main ceiling height quoted for the garage/workshop area? What is the width of each garage bay? Answer: The workshop is 11’-8” X 9’-9”. The depth of the loft is about 23’-4”. The minimum is 3’-2” and the highest is 7’-6”. The ceiling height is 8’. The width is 9’-1”. If you have any other questions, please feel free to contact me. Thank you in advance. Loft: 192 Sq. Ft. not 7' high.